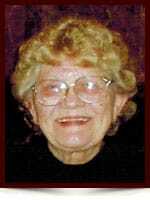 Beatrice Jessie “Lucille” Kowalski - Edmonton's Burial & Cremation Professionals | Trinity Funeral Home Ltd.
Beatrice Jessie “Lucille” Kowalski, known as Lucille Kowalski (nee Wentland, nee Davies), passed away on April 22, 2015. Lucille Kowalski is survived by her daughter Rebecca Harke, son Dana Kowalski, grandson Lawrence Harke (Aira), great granddaughter Lulu, grandson David Harke (Amelyn), and great grandson Allister. Lucille was predeceased by her husband of over 60 years, Larry Kowalski, son Lawrence Gene Davies, parents Emma and Roy Wentland, and brother Harold “stretch” Wentland. She was also predeceased by her first husband Lawrence “Gene” Davies. Lucille was born in Saskatoon, Saskatchewan, SK and was raised in Calgary, AB. Lucille was trained as a secretary but most of her career was in customer service. At one point, she worked as a millwright. Her last position was at the ABC Health Shop in Edmonton. Lucille was a beautiful and caring person and had a great love for life. She was well known for her sense of humor. Larry Kowalski, her husband of 60 years, was fond of her singing. Lucille will be greatly missed and be forever etched in our hearts. University of Alberta, Edmonton, AB, T6G 2E1. We would like to thank the staff on 5D3 at the University Of Alberta Hospital, Edmonton for her care. We would also like to thank Southwest Homecare.